In doing the Super Lean Regime, you will be expected to measure and monitor your body fat % (and weight and measurements if you want) weekly. Measuring your body fat will help you manage it better by providing proof of your progress and it should help to increase your motivation and help you to see the results by seeing the numbers go down. I’ve seen my body fat % reduce from almost 30% to 20% in 4 years when I increased and maintained my levels of activity and ate more healthily. You too can reduce your body fat by making the Super Lean Regime a way of life. In order to measure your body fat you will need to invest in a set of body fat scales or measure yourself weekly at your local pharmacy or leisure centre with the scales which provide body fat % readings. Luckily for us, body fat scales are relatively cheap now a days and you can pick a set up from Amazon or any large department store for anywhere from £15 upwards. The price of a set of body fat scales doesn’t necessarily reflect the accuracy of the scales, and I went for a cheap set of £15 Salter 9115 scales 10 years ago which are still going strong. Body fat scales look like ordinary scales. Body fat scales work by sending an electrical signal into your body and measuring the degree of resistance the signal encounters in your body. Electrical signals pass through fat more quickly than they do through muscle, so the less resistance the body fat scale registers, the higher your body fat percentage must be. Once a week on the same day of each week. At the same time of the day. With the same set of scales. Naked, or wearing the same amount of clothes. Try not to be tempted to weigh yourself any more than once a week as weight can fluctuate quite dramatically day-to-day. It’s best to do it weekly so that your body has time to adjust to the nutrition and exercise changes, you are putting it through. 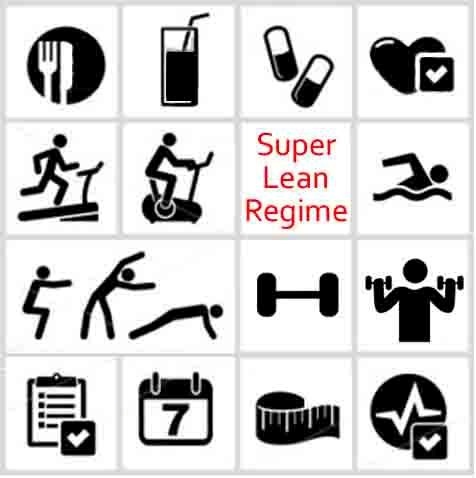 During the Super Lean Regime, you will record your body fat % (weight and body measurements if you want) once a week and review it as the weeks progress.